The Mekong Delta is always impressive with the natural scenery and lovely people that can only be fully discovered when traveling from place to place at a nice, slow pace. In the Mekong Delta, you can do sightseeing the waterway regions, visit old pagodas, orchards, family –run factories and interact with humble people. In addition, you can try authentic foods and listen to Southern Vietnam traditional music of Don Ca Tai Tu. Visit orchards, taste fresh fruits and discover local culinary specialties. 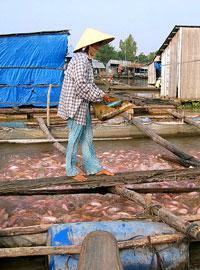 lively images of the famous floating market in Can Tho. Recognize specific features of Chau Doc Province. At 8 hours, our tour starts with a drive through the Mekong Delta to the small but quaint Cai Be floating market; from here we board our river boats for a cruise along the endless waterways of the mighty Mekong. There a time to visit fruit garden and bonsai garden on an islet, a pop –corn made factory as well as other handicraft village. At lunch time you will discover local culinary specialties. In the afternoon, we will reach Vinh Long Town where our waiting car will pick us up and transfer to the city of Can Tho, the heart of the Mekong Delta. We check in the hotel and relax after a long journey. Overnight in Can Tho. Today you will get up very early for breakfast so that we will be on time to catch amazing scene of Cai Rang Floating Market. Trip starts at 6.30hours with a river cruise to Cai Rang. There a chance to capture the most impressive pictures of the lively market on water and opportunities to buy some fruits and interact with local people. Leaving the market, take another boat trip along the river bank and canals to witness the local daily life; then relax in an orchard before boating back to the quay. More time to stroll around Can Tho City while waiting for lunchtime or collect luggage and check out for approximately 4 -hour journey to Chau Doc. Upon arrival in Chau Doc, we will get to the top of Sam Mountain for the great sunset view. Overnight in Chau Doc. After breakfast, we take a boat trip to experience Vinh Te channel, a 90- km man made channel from Chau Doc to Ha Tien and to visit Cham minority village with houses on stilts and floating houses with fish-bred in wooden cages. Then you also can stop over the Muslim Mosque of this Cham village. Return our hotel at around 10am. We check out and drive back to Saigon.